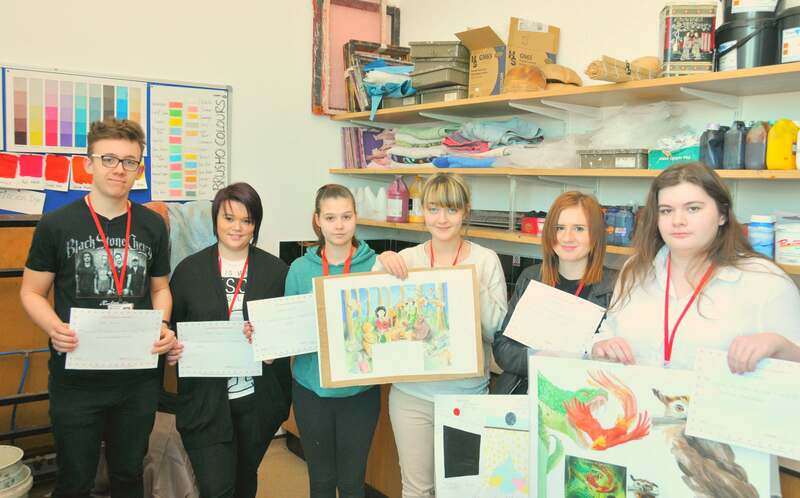 Students James Jackson, Laura Jepson, Shannon Wright, Georgie Lee, Brooke Grindle and Abbigail Webster with their designs. Barnsley College Art and Design Extended Diploma students have been busy creating wall designs that will be used within Shawlands Primary School. The students were given the brief to design a library wall to promote the love of reading, two display boards for Key Stage 1 and 2 as well as a sensory room for autistic learners. With just a £100 budget per area the art students used Photoshop designs, models, perspective drawing and took inspiration from illustrators of well-known children’s books. As not all of the designs could be used, the students had to compete for a chance to reproduce their work in designated areas within the school. Assistant Head Teacher of Shawlands Primary School, Lisa Tabbner, was invited to judge during a presentation at the college where students were able to exhibit their art work and demonstrate how their pieces would be ideal to be used within the school. She said: “The students whose work we picked were all very good artists who were able to answer our brief most effectively. They had used imaginative schemes which will support Shawlands Primary School in continuing to develop a love of reading. The chosen creations belonged to Brooke Grindle (sensory room design winner), James Jackson and Abbigail Webster (display board winners) and Georgie Lee (library wall winner).